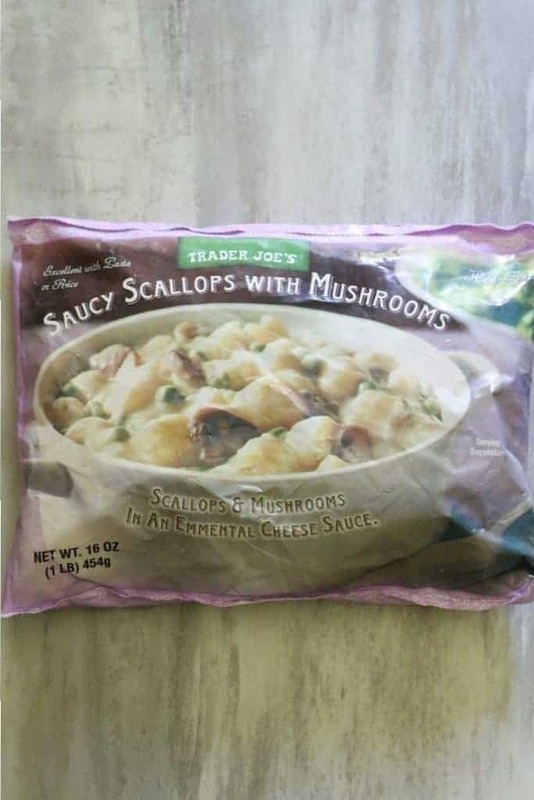 The pros: Trader Joe’s Saucy Scallops with Mushrooms is frozen but gives you well cooked scallops from the freezer. 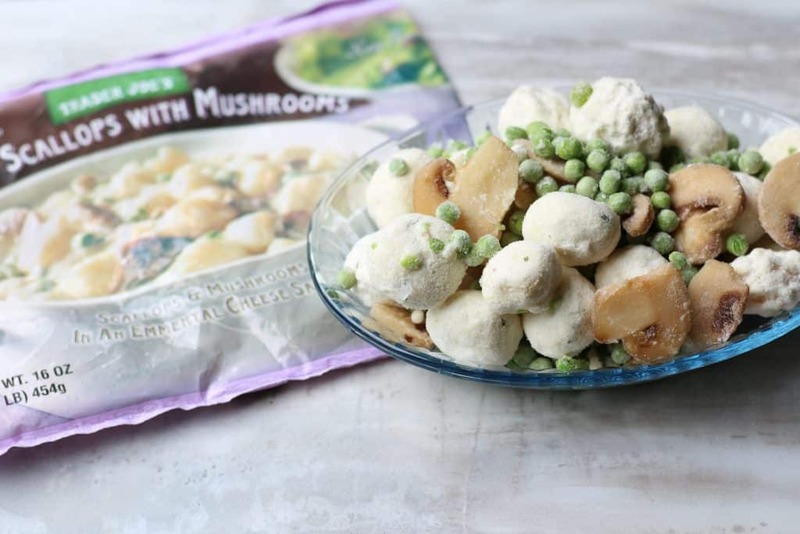 The cons: This product contained far more peas than mushrooms. 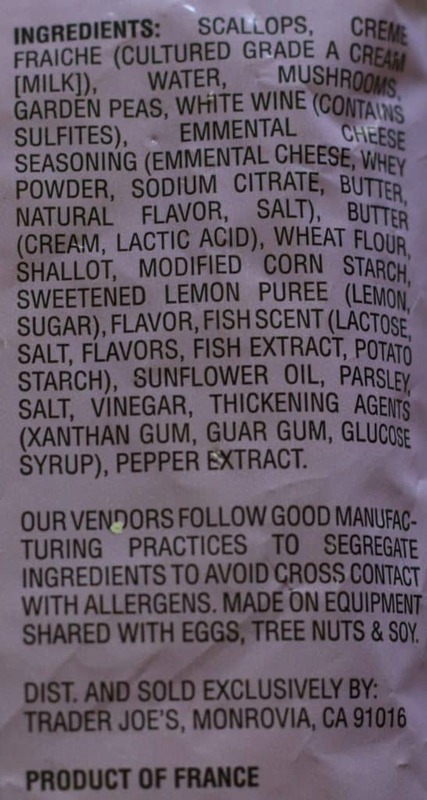 The cheese and seafood combination might not appeal to everyone’s tastebuds. The verdict: I love cheese. I love seafood. However, the idea of mixing the two doesn’t sound very appealing. 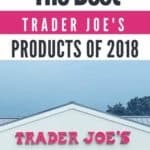 I’ve tried a number of seafood items from the freezer section of Trader Joe’s and found very few items I wouldn’t want again. Likewise, when I tried the Winter seasonal item called La Fondue, it was divine. That being said, the idea of mixing seafood with the fondue did not sound appealing which is probably why I chose to walk past it so many times. Fortunately, if you haven’t tried this item, it’s nothing like that. This item reminded me of an alfredo made of Emmental Swiss in the place of parmesan. It was not thick like fondue either. Out of the bag, I was a bit confused. I was concerned that very large scallops might come out of this. The scallops were small and tender out of the oven. They were not overcooked as they were covered in the frozen cheese mixture. The peas still had texture, but there were a lot of them compared to the amount of mushrooms. I did wish there were more mushrooms here. 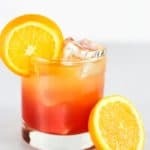 This is an item that would be best enjoyed with something that would absorb the sauce like rice or a pasta. Straight out of the oven the sauce was pretty hearty. There was a good amount of seafood for the price. In fact, for $5.99 per one pound bag this isn’t a bad deal. The one thing I did not test out how it would hold up using the microwave. 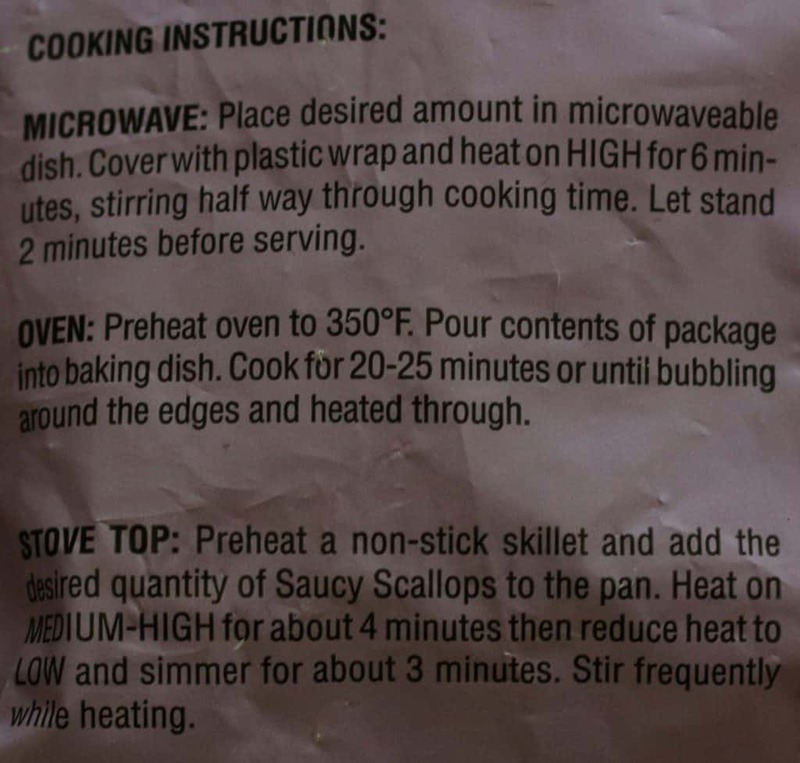 I do try to avoid putting any seafood in the microwave. Overall, I liked but didn’t love this product. I thought it was good but still find cheese and seafood a bit weird. Strangely enough I would eat a Surf and Turf dinner, so I’m not sure why I would find dairy and shellfish so strange. It’s something I might pick up on occasion to breakup some dinner monotony. This bag says it has 3 servings to it, but I think it would comfortably serve about 2 people with some pasta or rice. This is definitely a take it or leave it type of items. I’m sure it has it’s fans, but it did not wow me at all. Would I buy this again? 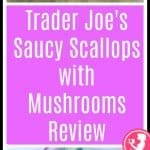 While this will not go on my weekly list, Trader Joe’s Saucy Scallops with Mushrooms is a good choice for something to have every now and again. I’d consider buying this again. 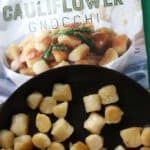 Have seen some reviews excoriating this product, which is too bad: it’s not horrible tasting, and a cheese or cream sauce isn’t uncommon with seafood in many parts of the world (which seems to be many critic’s chief complaint). 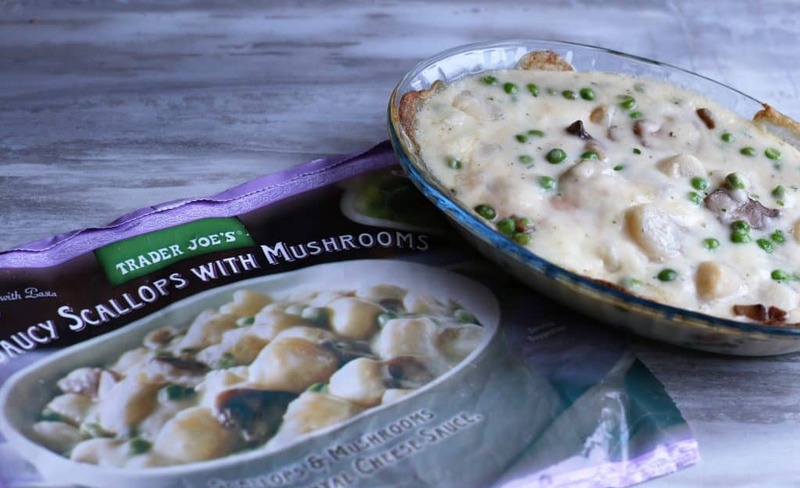 True – the mushrooms are a tad on the skimpy side (they don’t really freeze well, so not too much of a slam here, especially when adding three or four sliced mushrooms is not so very difficult). 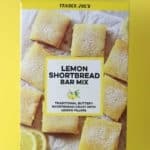 This TJ’s product is really pretty good for a quick Friday-night dinner for two. Hey Lucy! You are absolutely right. I think in the US you don’t see too many applications of the cheese/seafood combo. But it is a good quick dinner for two. Thanks so much for stopping by and sharing your thoughts! This is a pretty-good product for a quick dinner for two. 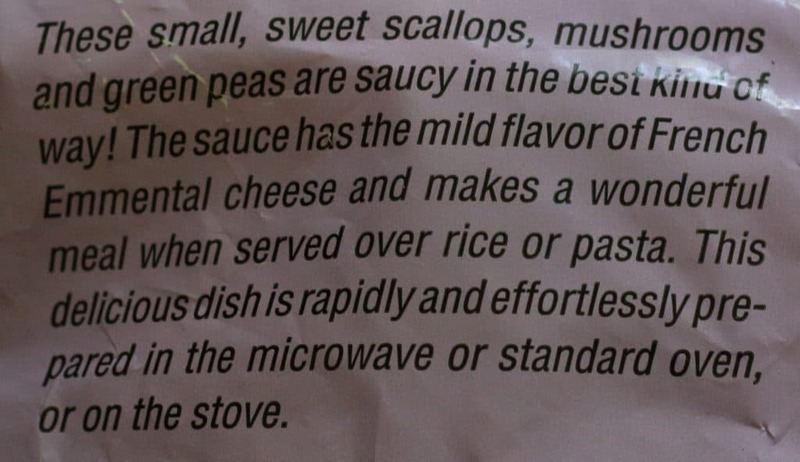 Have seen many complaints, mostly centering on the notion of a cheese sauce for seafood (actually fairly common in many cuisines that aren’t American-made) and a paucity of mushrooms (again, not too hard to slice up three or four mushrooms to add, if you like). 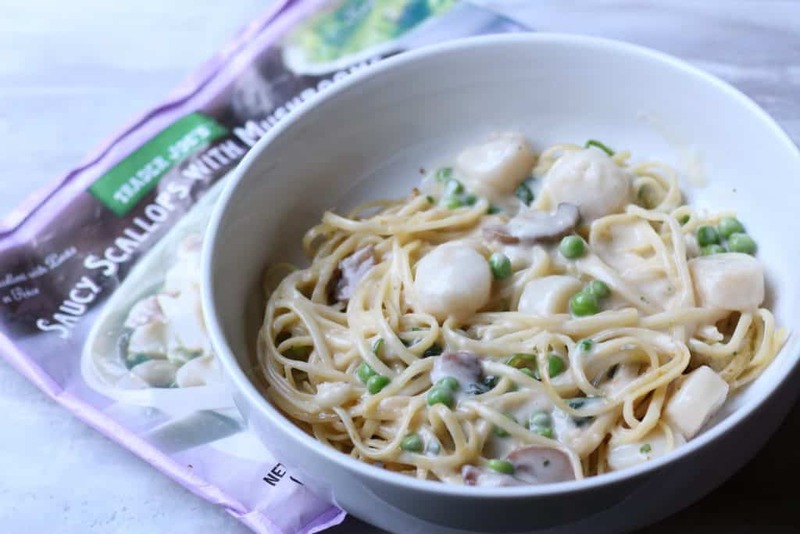 It’s best to be cautious with the scallops, though: if you let that sauce boil, you will sendup with tough bay scallops – but that’d happen if you cooked them too quickly from a raw state, too, so just be careful as you’re heating this. Hey Lucy! I’m all for doctoring up an already packaged product. I think Sandra Lee made that an “in” thing to do. I think any product that comes prepackaged always deserves the touch of the end user. 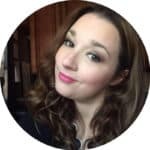 Thanks so much for sharing your insight! Hope you’ll stop by again! Plenty of scallops, cheese sauce and peas, but where were the mushrooms? 4 slices in something marked as 3 servings? Ultimately, I enjoyed it. Just wondering where the mushrooms were hiding. Hey CB! I agree that there could have been more mushrooms in this, but that can sometimes be a common theme. If you’ve tried the Shiitake Mushroom chicken in the frozen aisle, it suffered in the exact same way. A total lack of mushrooms. 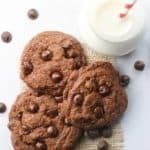 Thanks so much for taking the time to stop by and share your thoughts on this!